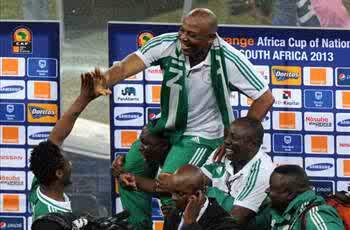 KESHI REFUSE EAGLES JOB ? Stephen Keshi has said he is not interested in returning as Super Eagles head coach. The 2013 African champions have been without a substantive coach since crashing out of the 2014 Fifa World Cup in Brazil following the expiration of coach Keshi’s contract. The ‘Big Boss’ who was overlooked by the Burkina Faso federation in its search for a national team coach as Gernot Rohr was picked said he was no longer interested in managing the Super Eagles while blasting the NFF liars for deceiving Nigerians. “Nigerians have been deceived; I never applied for the Super Eagles coaching job as the NFF have lied to Nigerians,” Keshi told Punch. “I didn’t receive any contract terms, nor did my agent. I only see all these things on the pages of newspapers, but I decided to keep quiet. The NFF has succeeded in deceiving journalists in Nigeria. “In one of the early interviews Pinnick had after he became NFF president, he made it clear that Keshi would not be coaching the team, so how come he is turning around to say he is offering me a new contract, and that I’m the one stalling. I’ve told them I don’t want the job. I’m tired of coaching and being surrounded by people who don’t want me in the job. and the winning bonus from the last Sudan game which we won. “They’re saying these things because they want Nigerians to see me as a bad person. I’ve been very patient and quiet but they kept lying about a contract.” Despite losing in the race to handle the Stallions, the former Togo and Mali handler said he was not troubled because everyone cannot be offered the job. “It was a privilege to be considered in the first place. Someone has to get the job and they can’t appoint everyone that applied. I’m not really bothered, such things happen. I’m going to consider other options I have and move on,” he concluded.